Shunt resistor is a type of current sensor and commonly used for the measurement of electric current. Also known as ammeter shunt or current shunt, it measures the current by monitoring the change of voltage along the resistor which is serially connected in the main circuit. The current shunts are usually made out of manganin resistors. Manganin shunt is particularly suitable for accurate current measurement - due to its highly stable propertities and extremely low temperature coefficient of resistance. The ISTEK series of shunt resistors are primarily designed and made for energy meters to measure the current with required accuracy level. As a competent supplier of latching relays to a number of major smart meter manufacturers, we are often requested to provide ammeter shunts to our customers. When required by a client, we can weld the current shunt directly on to the terminal outlet of a relay. Alternatively, we can weld the stranded copper wires to the shunt according to customer's technical requirements. 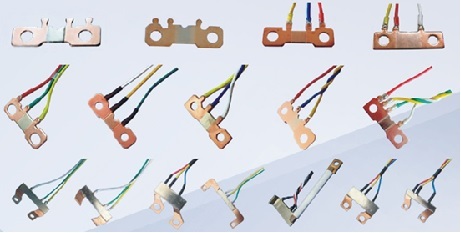 ISTEK has a wide range of cost effective current shunts for its international customers to choose. The resistance of these manganin shunt products spans from 100μΩ to 2000μΩ. We can work with customers to meet any special requirement if the resistance needs to be outside this scope.